/mo. for 24 months with 24 month agreement. Pricing, speeds, and availability vary by location. Requires AutoPay/E-Bill enrollment, otherwise $10 more per month. CenturyLink Business Core Connect 40 Bundle - Business High-Speed Internet and unlimited long distance phone service bundled into one low price. CenturyLink Business Core Connect 40 offers speeds up to 40 Mbps, a smart choice for business Internet with enough bandwidth to handle virtually any software application for your business. Unlimited long distance and local calling with favored calling features keep your budget in-line. Call today and start saving. 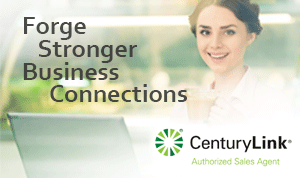 CenturyLink Business Internet 40 is perfect for high-demand daily online tasks. Downloading large files, uploading data files for back up, online video conferencing are all accomplished easily with CenturyLink Internet for Business. CenturyLink's 40 Mbps connection easily supports multiple users at the same time while unlimited calling in the U.S. with favored calling features, have your team working faster and smarter.